Salon product spillage is a regular affair at any salon. But, are you taking care to safeguard your client’s clothes when it happens? For this, cute and cool lab coats come to the rescue! These apparels are specially designed to provide a cover to your clients during such occurrences. If you are wondering where to buy these lab coats, look no further. Our exclusive lab coats for women are made of the top-quality material that is sure to give you the best comfort and coverage. Furthermore, these lightweight lab coats can be used by your stylists too. The full length, long sleeved stylish lab coats provide plenty of scope for ease of mobility while working. Our experience in the salon wear industry over the years assures that we offer the best lab coats in the market. We focus on giving assured quality and functionality, making us the go-to place for our customers. Other than Super Lab Coat we also offer Zip Smock, Barber Jacket, Caftan, Big Shirt, Super Coat and many more other salon smocks & coats. 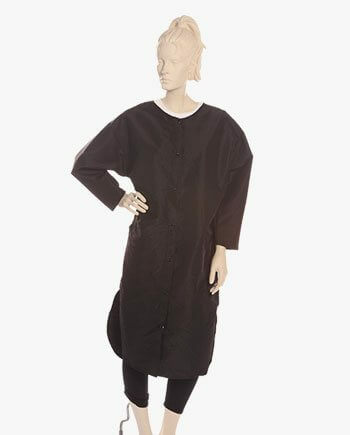 These cosmetology lab coats are made of Silkara Iridescent Fabric, which is stain and chemical resistant. The superior quality of the fabric provides both comfort and durability. The clients can sit back and relax while you carry out your routine work without any hassle. The lab coats for women are available in ‘one-size-fits-all’, cater to all body sizes, and offer extreme flexibility and comfort. With two hairless pockets, 7 snaps, and a mandarin collar, this stylish lab coat is designed to ensure maximum utility and coverage. Our professional lab coats are available in a classic Black color. These black lab coats look classy and exude professionalism. Apart from our wide range of salon apparel and spa accessories, our specialty lies in helping you establish your brand. How is that helpful? By customizing the apparels and uniforms with your logos, you not only strengthen your brand identity but also stand out as a professional salon. We can customize your salon logo on the products you purchase from us. For branding your custom lab coats, we use two unique and high-quality branding techniques such as Screen Printing and Embroidery. Our embroidered and monogrammed lab coats are sure to get your customers impressed! Why should you choose Salonwear’s Cool Lab Coats? We are distinguished market leaders in the salon apparel industry in the United States of America for the last 31 years, making us an extremely trusted name over the years. We are a one-stop solution for your salon wear and we believe in delivering top quality products with trendy and innovative fabrics. So don’t look elsewhere. Just shop at our salon wear website! We are a family business where our experience and knowledge about the industry helps us know and serve our customers’ requirements well. Keeping our customers happy and satisfied has always been our topmost priority. Read more about ordering information.